A host committee is in formation for the Capital Equality Democratic Caucus Holiday Social! Celebrate the season with LGBTQA+ and supportive Democrats! 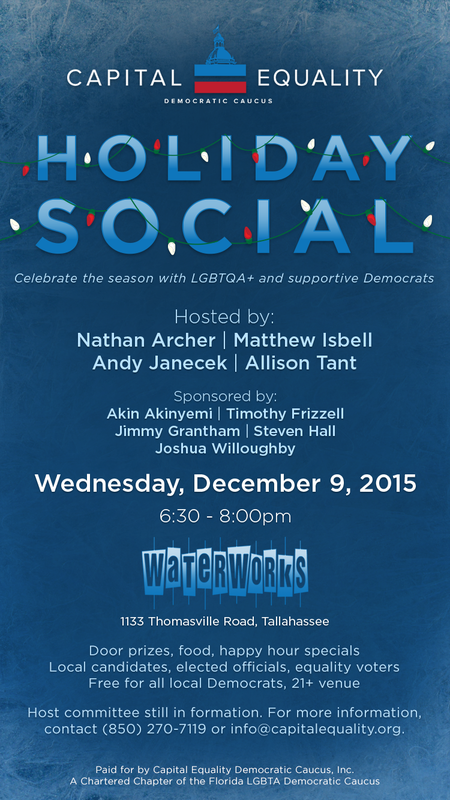 The event will take place at Waterworks, 1133 Thomasville Road, beginning at 6:30pm on Wednesday, December 9th! Enjoy door prizes, food, and happy hour specials! HOST status recognizes contributions of $100 or more. SPONSOR status recognizes individuals, organizations, or campaigns who donate a wrapped raffle prize (gift card, wine, decor, etc)! Proceeds benefit the ongoing efforts of the Capital Equality Democratic Caucus, a chartered chapter of the Florida LGBTA Democratic Caucus. To sign up as a HOST or SPONSOR, please contact us.